A little more than a year ago, Le Ron A. Wilson, not yet 18, walked into the military recruiting center on Jamaica Avenue in Queens and signed up to serve in the Army. He had the kind of brains and drive that make a good soldier, the persistence that wears down parents. His mother, Simona Francis, gave her permission. Yesterday, not far from the recruiting center, the short, happy life of Le Ron Wilson was recalled at a funeral Mass in Christ the King Church. Twice named soldier of the month in his platoon, a specialist in the repair of weapons, a correspondent with scores of friends on his MySpace page, Private First Class Wilson and another soldier were killed on July 6 by a roadside bomb. Many of those in the church yesterday wore buttons with his image. The pictures that show him fresh-faced do not lie. He was born on Nov. 16, 1988. He was not yet 13 during the attacks of Sept. 11 and never voted for a president. He barely had to shave. He is among the youngest soldiers killed in Iraq. Of more than 3,600 soldiers who have died in the war, about 30 have been 18. Tens of thousands of Iraqis young and old have also lost their lives. In the pews, his classmates from Thomas Edison High School dabbed their eyes. “Me and Danielle, one of our friends, tried to talk him out of it,” said Lilibel Araullo, 19, recalling when he enlisted. “A few others signed up. Justin. Derrick. I went to see him down in Savannah, before he left. These are the rites of connection for the young. 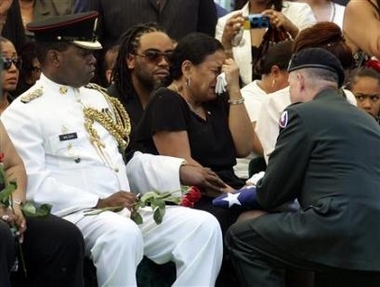 Rituals for the dead are woven into the church and the military. For the church, a bishop came; for the Army, a general. The bishop, Octavio Cisneros, recalled the suffering of the mother of Jesus, and prayed that she would bring peace to Private Wilson’s mother. The general, Bill Phillips, spoke of the fellowship of soldiers, their care for one another and their mission. He read the citations for the Purple Heart and the Bronze Star and the Combat Action Badge for service in Operation Iraqi Freedom, the name given to the invasion that started more than four years ago as a mission to eradicate weapons of mass destruction that turned out not to exist, and in retribution for the Sept. 11 attacks, which the Iraqis had nothing to do with. The name of the operation is not heard so often these days. The medals and a framed flag were presented to his mother. Ms. Francis handed them to relatives. Then the bishop, stood to begin the final prayers in the church. “Into your hands, father of mercies, we commend our brother Le Ron,” Bishop Cisneros said. When he was done, Ms. Francis strode behind her son’s coffin, composed but struggling. The young people did not bother. They wept openly, then pooled together in cars, ready to join the procession to Long Island National Cemetery in Farmingdale, where they would lay their friend down. A few blocks away, as the funeral procession moved east, it was break time at the military recruiting center where Le Ron Wilson declared that he would become a soldier. Two girls cantered streetward, down a flight of stairs, out into the sunshine. They paused beneath a sign for the center, where they are working through August. She was 14. Her companion was 15. All told, they said, nine teenagers, paid $7.15 an hour by the city’s summer job program, are working at the Jamaica recruiting center. Military recruiting, of course, is the work of professional soldiers, not teenagers in a summer program to learn how to hold a job. Still, it is not surprising that they would be drawn into the search for new soldiers. Just as youth must be served, so, too, must the needs of a country at war.